Do you have questions about Alzheimer’s and Dementia? You’re not alone. Dementia and how the disease is affecting peoples’ lives is something we hear a lot about these days, but many of us don’t know that much it. 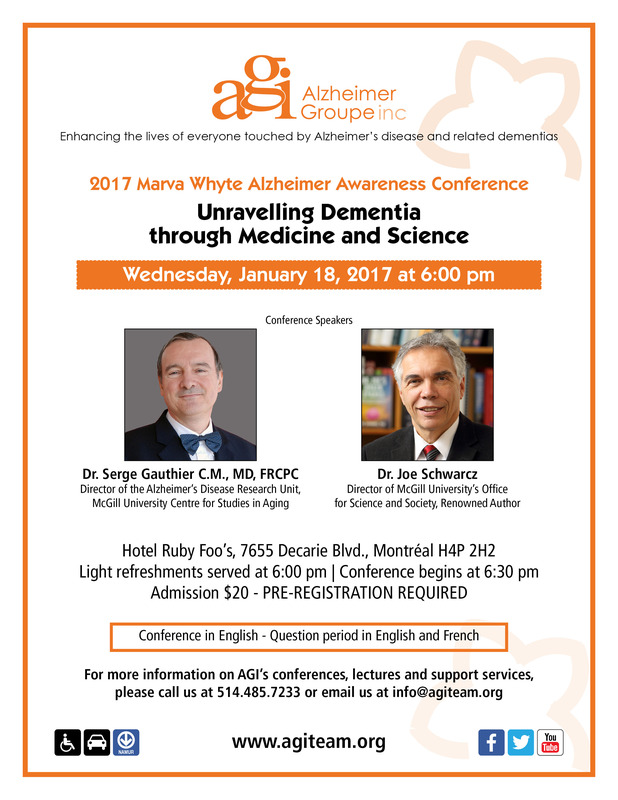 On Tuesday, January 18th at 6pm, Alzheimer Groupe (AGI) presents the Marva Whyte 2017 Alzheimer Awareness Conference, featuring Dr. Serge Gauthier, the Director of the McGill University Research Centre for Studies in Aging, and renowned Scientist and Author, Dr. Joe Schwarcz. They’ll be sharing the latest information on the treatment and prevention of dementia from a medical and a scientific perspective. There will be a question and answer period for the Doctors at the end of the evening. 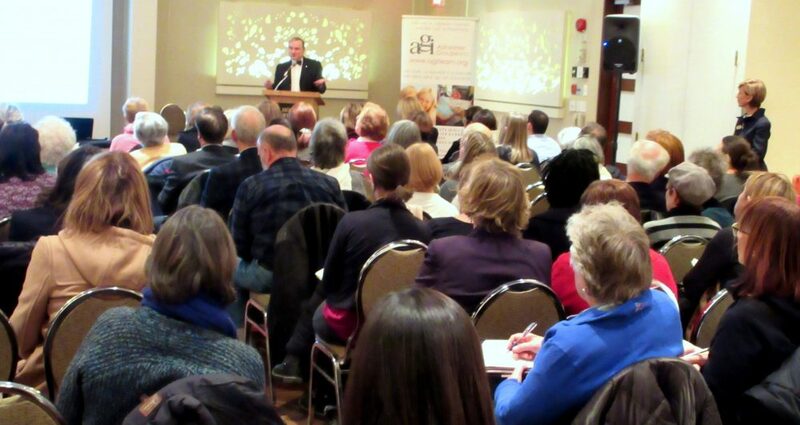 The Alzheimer Awareness Conference takes place at Hotel Ruby Foo’s, 7655 Decarie Blvd, Montreal. Caring for someone with Alzheimer’s or dementia can be quite challenging at times, and a little bit of information can go a long way to improving the quality of life of a family. 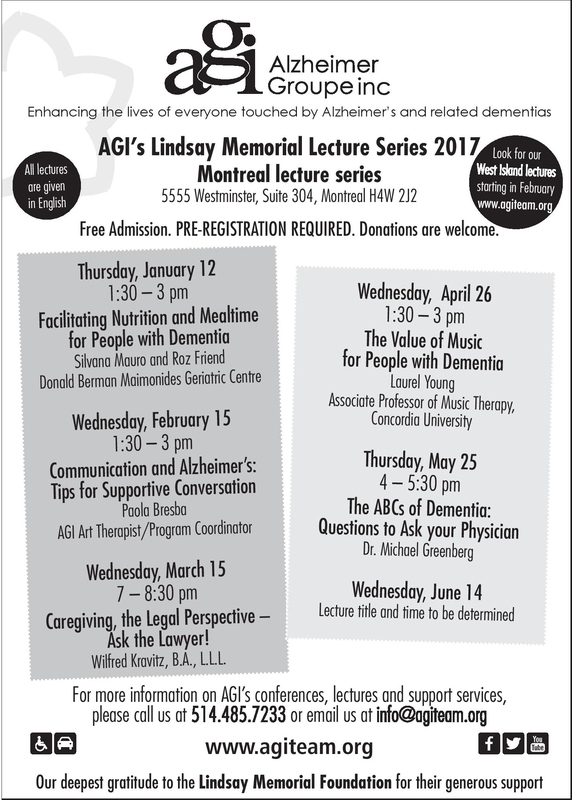 AGI hosts informative and engaging monthly lectures in both Montreal and in Pointe Claire on the West Island that feature guest speakers who are experts in their fields discussing topics related to dementia. These lectures are tailored specifically for family caregivers with a view to giving them the tools to help enhance their lives with their loved one with a diagnosis. Lectures are free and open to the public. 2017 Topics for Montreal and the West Island lectures may include: Facilitating Nutrition and Mealtime, Communication and Alzheimer’s, Caregiving, the Legal Perspective, The Value of Music for People with Dementia, Questions to ask your Physician, etc. A complete schedule with dates and topics for Montreal and the West Island will be available shortly. Watch for the West Island Schedule coming soon! 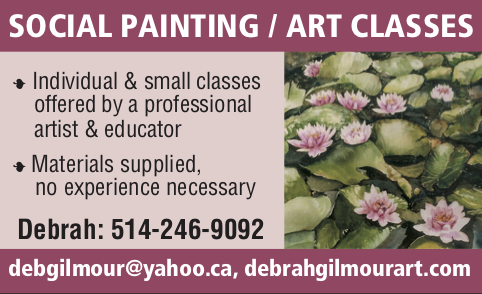 *All locations are wheelchair accessible. Be the first to comment on "AGI’s Marva Whyte 2017 Alzheimer Awareness Conference"